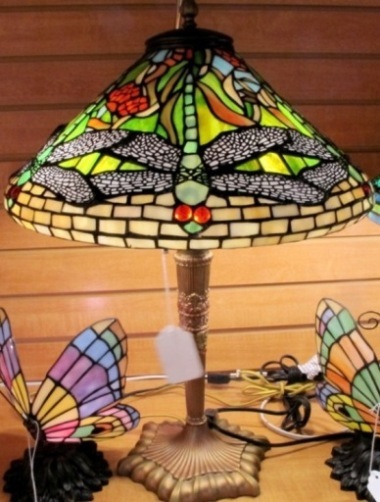 Selecting a stained glass lamp is completely different from selecting other types of lamps. There are many special considerations due to the nature of this very unique lamp style. First lets define this lamp style. We are not necessarily referring to genuine authentic originals but to the style itself of which there are many thousands or maybe millions. They are composed of numerous hand cut pieces of stained glass in a variety of colors and textures which have been soldered together using a copper or lead border around each individual piece. The glass pieces form a pattern traditionally involving an aspect of nature but often in many wide variety of styles ranging from Art Nouveau and Mission to modernistic. I have written a separate history of Louis Comfort Tiffany whom this lamp style is named after and also the process of how these lamps are made so those subjects will not be covered here. Now let's determine how to select one for your personal use. Many of the considerations in selecting a lamp simply do not apply when considering a this style lamp. You may somewhat forget your current home decor theme and whether it is formal, casual, country, contemporary, etc. You will not necessarily want your stained glass lamp to "fit in" with what you already have in your home the way you might for another style. The main purpose for the lamp is very important: reading, writing, work project, area lighting, accent lighting, an object of art, a beautiful specimen, just a pretty art object that will light up an area? A Tiffany style lamp is usually not the first choice for reading and projects unless the shade is very large and holds at least 3 sockets. Even then, the glass should generally be brighter in color so as no to absorb the light. Darker glass absorbs more light and is less efficient for reading, etc. What are the colors in the room where you are putting your new lamp? The new lamp you are considering may incorporate one or more of these colors but not necessarily so. This may seem counter intuitive and possibly comes as a surprise because you normally consider this characteristic near the top of the list. This speaks to the very nature of this lamp. It is a specimen and it should stand out and not blend into its surroundings. Psychologically we see any specimen as standing alone without peer and without compliment. This allows you a tremendous amount of latitude in decorating that can tread the outer limits of what would otherwise be considered acceptable. When helping a customer in our showroom select one of these lamps, I will often suggest that the customer begin consideration with what they really love. Normal size limitations not withstanding, passion is of prime importance. If you do not love it - do not buy it. If you do - then buy it. It really is often that simple. Here are a few rules that apply to all lamps including Tiffany style lamps: Size of home decor items are very important as they relate to each other in the same room. How big is the table, counter, shelf, etc. where the lamp will sit ? A large lamp on a small table or small area will appear overpowering. A small lamp by itself on a large table or in a large area will appear lost. How large is the room where the lamp is to be used? A tiny lamp left exposed in a huge room will appear lost and vice versa. How high are the ceilings? Many medium to large homes today have 17' or taller ceilings in the great room. Generally a 28-30" tall (or above) end table lamp is right at home in a room this size. Of course a lamp sitting on the bookcase in this same room may only be 12-15" tall. A mantel lamp in this same room may be 25-35" tall. Think of relativity (remember Einstein). You should already be well on your way to fine tuning your ideas about purchasing a Tiffany style lamp. Just remember to keep your passion in the forefront. It's more fun anyway !